Membership is open to anyone keeping bees or having an interest in the craft of beekeeping. 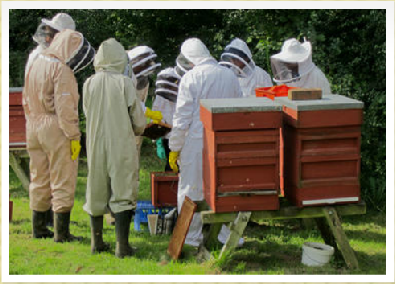 Beekeeping today is a fascinating and rewarding activity but at times can be challenging. Caring for bees, like caring for any livestock, can be affected by adverse weather, pests, disease and bad luck. Successful beekeeping requires some degree of dedication to acquire knowledge and understanding of bees and their needs. Also, in this global world with changing climate, it is necessary to keep up-to-date with developments. Membership of the British Beekeepers Association (BBKA) is one of the best ways to access knowledge and keep abreast of the beekeeping news. Membership through joining a local branch has the added advantage of shared experience and personal support through the rough times as well as the good. BBKA Membership ID card which entitles you to 5% discount at National Bee Supplies, Okehampton on production of the current card. BDI certificate covering you against various third party liabilities and colony losses. Monthly issues of BBKA News from the British Beekeepers' Association. 10 issues each year of Beekeeping the journal of DBKA. Access to the DBKA Members Section with association rules, contacts, useful information and a Directory of all DBKA members. Invitation to attend meetings of the other DBKA branches (with prior agreement of branch secretary). Monthly Okehampton branch newsletter by email or post with details of our forthcoming programme. Access to branch library of beekeeping books. Access to branch equipment (e.g. honey extracting and filtering). The chance to attend approved training courses. The opportunity to attend lectures, workshops and conventions. Invitation to join Booker Cash & Carry for purchase of bulk sugar. Are You Interested In Keeping Bees? Both the Devon & British Beekeepers websites have useful 'Getting Started' pages. For more information on membership categories see the attached subscription form below. N.B. Additional colony BDI supplements are due for more than 3 colonies - see subscription form download below for details.